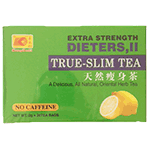 Extra strength dieters, II true slim tea. A delicious all natural oriental herb tea. No caffeine. 20 tea bags in a box. Product of China.